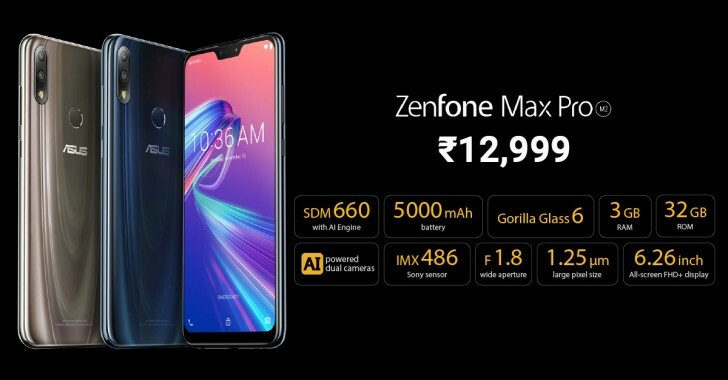 Asus just unveiled the Zenfone Max (M2) and Zenfone Max Pro (M2) (yes, they appeared a few days ago, but apparently that was premature). They go on sale in Indonesia tomorrow and in India on December 18 (next Tuesday). In Indonesia, Lazada will have exclusivity on the Max (M2) and will charge IDR 2,300,000 for it. Shopee will exclusively offer the Max Pro M2 for IDR 2,800,000. Note these are online deals, but starting December 14 there will be units in 12 Asus partner stores around the country. On that they they will gift you a free Asus power bank with each M2 you buy. In India, Flipkart has exclusivity on both models. The Zenfone Max (M2) starts at INR 10,000 and the Pro model at INR 13,000. Update: The Pro model is coming to the Philippines on December 15 through Lazada and Shopee. It will cost PHP 15,000 for the 6/64GB model. Here’s a quick introduction to both phones. They run stock Android and will get Android 9 Pie in January. Also, you get 100GB of Google Drive storage with them. The Asus Zenfone Max Pro (M2) is powered by a Snapdragon 660 chipset and packs a 6.26” screen with 1080p+ resolution (19:9 with a notch). This makes it a competitor to the Xiaomi Mi A2. Anyway, the base model has 3GB of RAM and 32GB storage. The card slot holds two SIMs and a microSD, so there’s an opportunity to expand. The fully-loaded model has 6GB of RAM and 64GB storage. The Pro has a 12+5MP dual camera on the back (with Sony IMX486 sensors, 1.25µm pixels, f/1.8 aperture). The second module is a depth sensor. In the notch on the front is the second dual camera – 13+5MP with dedicated LED flash. The phone packs a large 5,000mAh battery. There’s a fingerprint reader on the back and face unlock is enabled too. The loudspeaker boasts an NXP SmartAmp.